SUBMISSION TO #RTF2019 HAS CLOSED. Notifications for selected films will be sent out by mid April. REALTIME INTERNATIONAL FILM FESTIVAL (RTF) proudly accepts entries exclusively via FilmFreeway, the world's #1 submission platform. FilmFreeway offers free HD screeners, unlimited video storage, filmmaker profiles, and more. Subscribe to our newsletter and be the first to know when submissions commence for the next season. The Awards Ceremony for the participants of #rtf2018 #rtfchallenge took place at Sheraton Hotel, Ikeja on Saturday, March 30th, 2019. Filmmakers were presented with trophies, medals and certificates. ​"RELENTLESS" while the Festival Program theme is "PALLETTE"
At #rtf2018, 34 Awards were presented to deserving Filmmakers from around the world, whose works resonated not just with the jury, but also the audience. On behalf of the entire team, I wish to congratulate all the nominees and eventual winners. Head of Jury, RTF 2018. Our Festival Catalogue Theme for 2019 is "RELENTLESS" while the Festival Program theme is "PALLETTE"
Our goal is “to build a truly International, all - inclusive and remotely accessible Film Festival”. Our corporate VISION is “to become the biggest and most acclaimed technology – driven, remotely accessible Festival in Africa with a keen interest in Cultural & Creative Arts". Our MISSION is to champion an Artistic baseline where equity and openness is enhanced among Creative Artists, Filmmakers & Film Enthusiasts; in other words, a platform "Where everyone feels equal"
'Our LANGUAGE is "ART", our MEDIUM is "TECHNOLOGY" and we celebrate the "HUMAN TALENTS" responsible for churning out "ARTISTIC FILMS"
The Festival accepts entries from filmmakers across the world without discrimination. We also offer waivers for submission fees to filmmakers from countries like Iran, Pakistan and others who can't pay for submissions due to limitations caused by sanctions imposed on their countries. We celebrate the FILMS and their MAKERS. We also celebrate and expose current TECHNOLOGIES that affect the art of film making. That's our focus hence, we do not seek to be the most glamorous Festival, but rather, our desire is to be known for being the Most Innovative, Eco friendly and Technology attentive Festival in Africa that attracts the world! During our inaugural edition, we had over 800 submissions from 80 countries out of which 60 films from 25 countries were screened. Our Festival Catalogue Theme for 2016 was "EMOTIONS" while our Festival Program Theme was "INNOVATIVE TECHNICAL CONVERSATIONS"
Submissions for the 2019 edition are being processed at the moment and the Festival Catalogue Theme for 2019 is "RELENTLESS" while the Festival Program theme is "PALLETTE"
Our goal is to explore the effective use of Current Technology as a medium to foster genuine human interactions in a bid to highlight prevalent socio-cultural trends and put them under objective scrutiny by the use of emotion laden story-telling presented in a professionally tailored medium - Film. We believe that films must have the element of entertainment; we also believe that the functionality of the art of film making can be carefully embedded within the audio-visual experience to mold minds, start subjective conversations and gain access to the conscience of the viewers in an attempt to arrive at objective social patterns that will inevitable bring about social change through advocacy. Films can have lasting effects on people. Beyond the charisma of clerics, the flamboyance of politicians and agitations of activists; a simple film by a filmmaker of inspiration can influence global behavioral patterns and cause lasting change. Movies like Black Fish, The day after tomorrow, Rosetta, Cathy come Home, Philadelphia, Super Size me, End of the Line and Selma are listed on the website of the World Economic Forum as ''MOVIES THAT CHANGED THE WORLD''. As a Festival, we have focused on the Art behind Film making and the Technology that brings the art to life and we intend to constantly throw requisite spotlight on the ever evolving technology that facilitates and dictates film making trends. In our first edition, we explored practices that had not been adopted by other festivals worldwide - even the biggest of them. One interesting innovation of ours is the encouragement of remote participation. Unlike other festivals where filmmakers who are not able to travel to the physical location are unable to participate in the Q&A Session after their films are shown, we decided to make extensive use of Skye for our Q&A Sessions - for filmmakers who were absent. It was an effective and Eco - friendly innovation. We are proud to say that we are a "GREEN", Technology driven Festival. Our Festival is also the Only Festival in Africa so far, with a category for films "made by children". 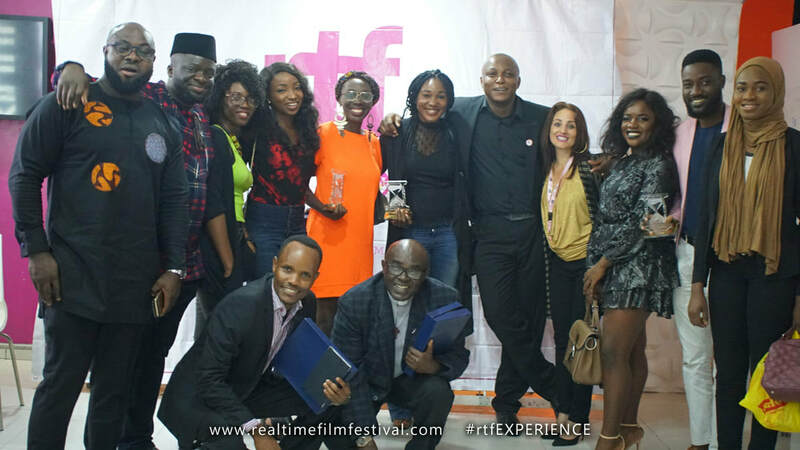 Our 2017 edition had a category for "Best African Female Producer / Director" thereby celebrating the women in the business of Film making. To make it easier for female filmmakers to submit their works, the category is the ONLY competitive category without a submission fee. Real Time International Film Festival also fosters co-productions and so far, we have two co-productions in Animation and four co-productions for live action films in the pipeline. We celebrate the co-productions because they will help filmmakers from different parts of the world to break fresh grounds when their expertise is exhibited and celebrated in other countries / regions. We offer free master classes in Directing, Cinematography, Photography, Acting and The use of social media in executing effective P&A (Publicity & Advertising) for movies.